Based on the curatorial practice of Frederico Morais and Walter Zanini, Ana Paula Lopes reflects on curation as an event in response to the times of dictatorship in the '60s and '70s in Latin America. A partir del trabajo curatorial de Frederico Morais y Walter Zanini, Ana Paula Lopes reflexiona sobre la curaduría como acontecimiento en respuesta a los tiempos de dictadura en los años 60s y 70s en Latinoamérica. Installation process of one of the lots. Image of the exhibition Jovem Arte Contemporânea, 6th edition, 1927, MAC USP. Photo by Gerson Zanini. Image courtesy of MAC USP. While I was studying art, curation was an uncharted field, a guiding force in my research. Every discovery, regardless of whether the curatorial project was carried out in Brazil or elsewhere, offered a new way of thinking about the world, the artistic object, and the politics of space. Since then, curation has become my position of judgment, both for political and object-oriented issues. And precisely because of this, my research is increasingly focused on developing the notion of curation and the curator in Latin America. Historicizing Latin American curatorial practices allows one to trace out their differences, make their complexities resonate, and extend new horizons. For this study of curatorial practices and the Latin American curator, it is necessary to position myself at the margins. To let history be told in books of “official cultures” so that their omissions leak out, showing us the expanses of a heterogeneous Latin America. My goal is to provoke discussion and stir up conflict because so many stories remain untold in these “official” books. What do we study today? For the most part, white art from European countries and North America. In this way, I propose to explore the relevance and construction of curation in Latin America, with the idea of positioning Walter Zanini and Federico Morais as boundary posts in the experiment of Brazilian curation due to their ongoing influence today. Permuto. Inscrição no. 39. Image of the exhibition Jovem Arte Contemporânea, 6th edition, 1927, MAC USP. Photo by Gerson Zanini. Image courtesy of MAC USP. I will begin by considering how curation and the curator are conceptualized, as I consider this important in developing my line of reasoning. 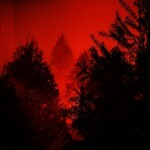 However, it should not be taken as the only or most relevant idea, rather as one among many others. Cildo Meireles, Tiradentes – Totem Monumento ao Preso Político, 1970. Action that consisted in the burning of ten live hens tied to an eight foot tall pole on the anniversary of Brazil’s national independence hero, popularly known as the Tiradentes. Image courtesy of Galeria Luisa Strina. Curation is characterized by an extremely singular attitude that establishes new modes of doing that echo into the present, making it possible to construct alternative histories. Based on Morais’s idea of the avant-garde as rearguard, many events can be understood as milestones of what in the future would be known as the curatorial field, not only bearing fruit during the turbulent moments of human history. However, the interwar period or the period of Latin American dictatorships (1960s-1980s) forced us to work in a state of alert due to authoritarianism, repression, and scarcity. Despite these barriers, it was during the period of military dictatorships that Latin American art became an experimental “open field.”  Exhibition organization9 was the most critical field of action where the socio-political, the conceptual, and the ephemeral—specific characteristics of art at the time—were altered. This was the case for the exhibition Do corpo a Terra (From Body to Ground), organized by Frederico Morais in 1970 in the Belo Horizonte Municipal Park in Minas Gerais. During the exhibition, the intention, now recognized as curatorial, broke out of the closed gallery space and extended, as its title suggests, to the land through performances, happenings, interventions into public space, and the active participation of the audience. Morais did not only recognized political issues. 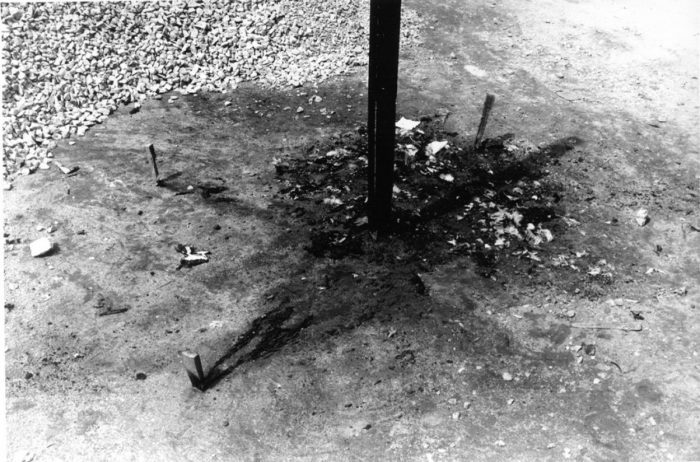 In addition to making direct reference to the military dictatorship—for example the work Tiradentes—Totem Monumento ao Preso Politico (Tiradentes —Totem Monument to the Political Prisoner) (1970), in which Cildo Meireles set fire to live roosters—also articulated the process-oriented characteristic of the era’s art and the fragility of artistic ephemerality with such work as Artur Barrio’s Trouxas Ensanguentadas (Bloody Bundles) (1970), in which bleeding bodies wrapped in cloth appeared in the Ribeirão Arruda. View of the exchange action. Image of the exhibition Jovem Arte Contemporânea, 6th edition, 1927, MAC USP. Photo by Gerson Zanini. Image courtesy of MAC USP. 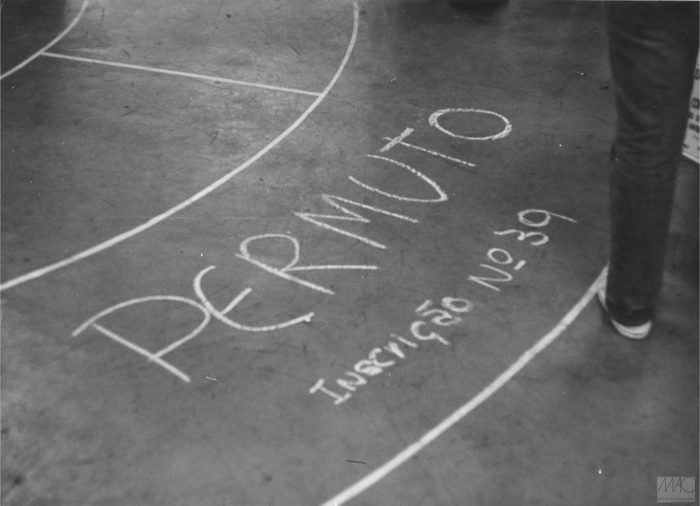 This curatorial focus on political protest centering on the body can also be seen in Domingos da Criação (Creation Sundays), a program also organized by Frederico Morais and which took place over six Sundays between January and August 1971 at the MAM-Rio de Janeiro. This program—which brought together artists such as Carlos Vergara, Antonio Manuel, Cildo Meireles, Amir Haddad, Regina Casé, among others—was an extension of the courses that Morais taught at the MAM around educational practices and museography. These courses understood, on one hand, the possibility of art education from the idea that the workshop could be any type of space where teachers and students could meet and where the making of the work would respond to the materials available at the moment. Moving away from the traditional understanding of artistic techniques, this pedagogical reflection also opened up the idea of the museum beyond the institutional rigidity of its delimited space and its collection, and allowed it to become a laboratory of experiences that allow its integration into everyday life through its extension throughout the city. This is why Domingos da Criação took place in the open space in front of the museum during the summer, a time when Brazilians were looking for activities in open spaces. Morais defined Domingos da Criação as “manifestations of free creativity with new materials”. The actions used materials provided by industries based in Rio de Janeiro, such as yarn, paper or dirt which the invited artists adapted to the objectives drawn up by the Manifesto Do Corpo à Terra (1970) written by Morais. The manifesto explains that art, as a national project dispersed through museums, should be an exercise of freedom, vital for the social life of the human being. It emphasizes the importance of organizing art for the understanding of innate playful and creative freedom in human beings. Here lies the importance of departing from the rigidity represented by the museum institution. In his vision, art that extended beyond the object—to situations, events, or rituals, individual or collective—was part of life itself. Art had no limits and remained beyond the circumstances. Morais argued that the fetishization of the common object by Pop art was nostalgia for finding life in a commodified existence. At the same time, the “dematerialization” of art extended to human experience, consequently art could be found in the return to the body and the ground, elements in which the object is found and which allow a participatory relationship through the senses and natural elements. Morais’s curatorial projects were a critical activity that linked art with everyone regardless of whether they were artists or not. In the case of Domingos da Criação, this happened because the works took place on the patio of the MAM-RJ—a public space open to passers-by—where curation becomes something communal. Morais engaged with important contemporary ideas like Arte Povera, happenings, body art, and, most interestingly, rather than conceptually he explained them organically. Cildo Meireles, Tiradentes – Totem Monumento ao Preso Político, 1970. Action that consisted in the burning of ten live hens tied to an eight foot tall pole on the anniversary of Brazil’s national independence hero, popularly known as the Tiradentes. Image courtesy of Galería Luisa Strina. In parallel with the activities organized by Morais, professor Walter Zanini was also transforming the space of the museum, pushing it to be more than a cultural agent  to become a dynamic hub offering diversified programming in music, dance, film, talks, and art history classes. Walter Zanini (1923-2013) was a professor, journalist, researcher, and curator. He led the MAC-USP until 1978 and also stood out for his activity in the academy, where he was a professor in the Department of History in the Faculty of Philosophy, Science, and Humanities and taught art history. He was also one of the founders of the ECA-USP (University of São Paulo School of Arts and Communication), and helped to found the Visual Arts Program at the Armando Álvares Penteado Foundation (FAAP) along with Donato Ferrari, Regina Silveira, and Julio Plaza. His research was published in articles, newspapers, and books, including “the most important historiographic effort ever published in the field” of Brazilian art history, História Geral Da Arte No Brasil, Volumes I and II, edited by the Moreira Salles Institute in 1983. The publication, which sold out years ago, was prepared by a team of 16 experts, among them the anthropologist Darcy Ribeiro, architect and artist Carlos Lemos, photographer Boris Kossoy, and the art and education researcher Ana Mae Barbosa. Walter Zanini, along with his team of Gabriela Wilder, Raphael Buongermino, Donato Ferrari, and Laonte Klawa, discussed the selection parameters with the idea that the exhibition would be open to anyone interested in participating. Ferrari proposed that participation be determined by a lottery on the first day of the show, which any artist could enter and which would be developed by a group of Visual Communication students at the Armando Álvares Penteado Foundation working under the tutelage of Laonte Klawa. Klawa split the 1,000 m2 temporary exhibition space of the MAC-USP into 84 differently shaped lots, effectively turning the museum into an enormous studio from October 14-28, 1972. The emphasis of this exhibition was on artistic process. The exhibition rejected the centrality of the unique object , instead centering dialogue on the impermanence of the work and on achieving a form of curation that was attentive to process and the relationship between physical space and the body in order to challenge the closed space of the museum. Why do I mention this? At the time, the MAC-USP managed the third floor of the São Paulo Biennial Foundation, located in an Oscar Niemeyer building with vaulted ceilings and framed by expansive windows. An imposing building, more exclusive than inclusive. Installation process of the exhibition. Image of the exhibition Jovem Arte Contemporânea, 6th edition, 1927, MAC USP. Photo by Gerson Zanini. Image courtesy of MAC USP. Like Morais, professor Zanini brought innovation and radicalism to all the spaces he worked in. Under his management, the Contemporary Art Museum of São Paulo University (MAC-USP) organized national and international shows including: the exhibitions of works by Vicente Rego Monteiro, Anita Malfatti, and Flávio de Carvalho, which were part of the permanent collection; hosted an international project in collaboration with the Museum of Modern Art in New York City, and held photographer Cartier-Bresson’s first exhibition in Brazil in 1970, among other events. The space also sought to recover lost stories, showing, for example, the work of Jeff Golyscheff (1898-1970), a painter and musician who was involved in Dada in Berlin. Golyscheff lived anonymously in São Paulo until the day he entered the museum and told Zanini his story. Zanini recounts that it had previously been thought that he had died in Europe. Moreover, when he was in charge of the 16th and 17th editions of the São Paulo Biennial, his curation was formative in that it marked the end of the practice of organizing the Biennial based on nationality. 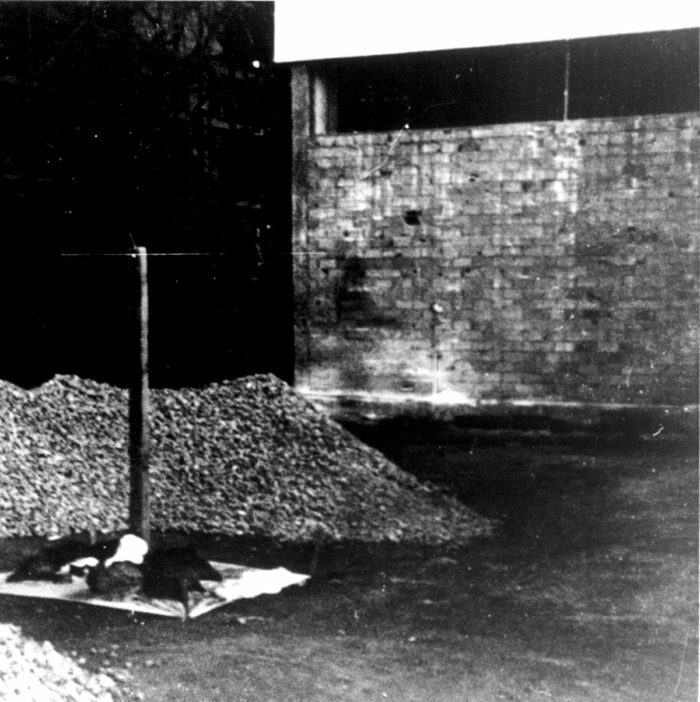 In the 16th edition, he put artists like Anna Bella Geiger, Cildo Meireles, and Richard Long together, and in the 17th edition he juxtaposed traditional techniques like feather art with work of the Fluxus group. In this same edition, which integrated video art and new artistic languages, it also became clear that Zanini was one of the most important propagators and legitimizers of these mediums. Organizing, for example, the first video art exhibition at the MAC-USP. Both Walter Zanini and Frederico Morais approached a spirit of radicalism, connected not just to the concept of the occurrence as theorized by Milton Santos, but also the concept of anthropophagy. This philosophy, established in the 1928 Anthropophagic Manifesto written by Oswald de Andrade, calls for us to search for our origins, but also to look to the Other to acknowledge alterity. This rupture at the border leads to the emergence of the hybrid and the principles of appropriation discussed by David Evans in Appropriation (2009). Oswald proposes crossings between cultures and an immersion in our origins, concerns that later culminated in the Tropicália movement. These interceptions lead to the emergence of the Other, a force that permeates the heart of the democratizing thought of these great masters. Enrollment for the lot raffle. Image of the exhibition Jovem Arte Contemporânea, 6th edition, 1927, MAC USP. Photo by Gerson Zanini. Image courtesy of MAC USP. 1. Bakhtin, Mikhail. A cultura popular na Idade Média e no Renascimento. (Sao Paulo: Universidad de Brasilia, 1987), pg. 238, 239. 2. Néstor García Canclini. Hybrid Cultures: Strategies for Entering and Leaving Modernity. 9. 3. Hans Ulrich Obrist. A Brief History of Curating. (São Paulo: Bei, 2010). 4. Milton Santos. A Natureza do Espaço: Técnica e Tempo, Razão e Emoção (São Paulo: EDUSP, 2006), pg. 94. 5. Obrist. Hans Ulrich. Ibid., pg. 16. 6. Milton Santos. Natureza do Espaço, Técnica e Tempo, Razão e Emoção, 1996. pg. 94, 96. 8. Wolfgang Pfeiffer, Em campo aberto. Catálogo 6ª Exposição Jovem Arte Contemporânea Museu de Arte Contemporânea da Universidade de São Paulo. 1972. 9. At that time in Brazil, the term “curation” did not exist. Instead, the term “exhibition organization” was applied to the organization of shows that art critics or academics held in museums, cultural spaces and galleries. 10. M.A Ribeiro. Interview with Frederico Morais, A Arte Nao Pertenece a Ninguém. UFMG, Belo Horizonte, V. 20, n.1, p.336-351, Enero/Junio, 2013. 11. Dária Gorete Jaremtchuk, Jovem Arte Contemporânea en MACUSP (Master’s Thesis at the University of São Paulo, 1999), pg. 4. 12. Angélica Morais, “Morre Mestre Zanini,” Revista Select, January 29, 2013. 13. 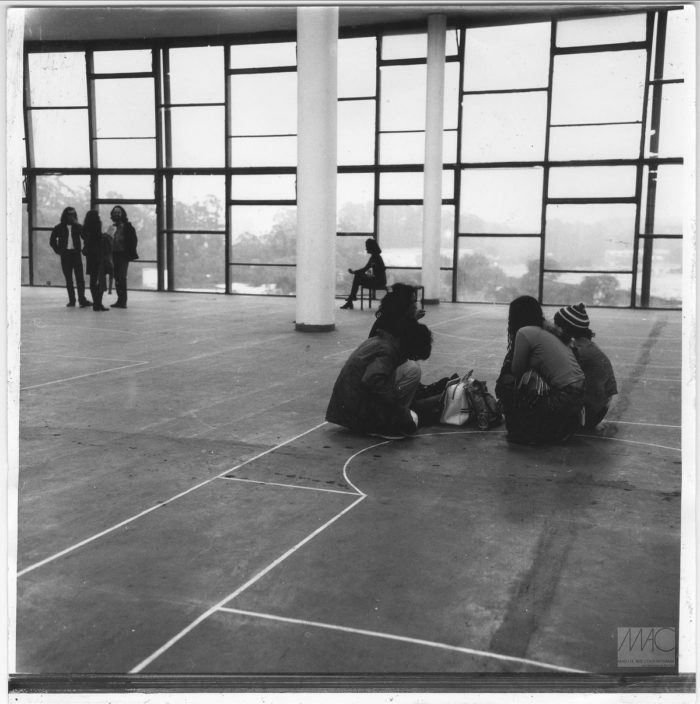 Catálogo 6ª Exposição Jovem Arte Contemporânea, Museu Arte Contemporânea da Universidade de São Paulo, 1972. 15. Walter Zanini. Novas Potencialidade. Catálogo 6ª Exposição Jovem Arte Contemporânea, 1972. 17. I would like to point out parallel artistic production outside Brazil that the group Escena Avanzada began developing in 1973 during the Chilean military dictatorship. Their production, as critic and curator Nelly Richard has mentioned, belonged to the “unofficial field” of Chilean art, located beyond the historiographical categorizations of art. 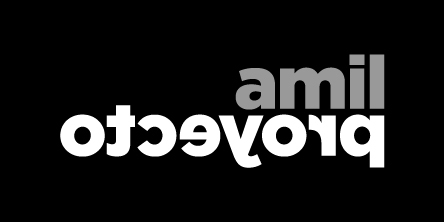 Escena Avanzada was founded by the artists Carlos Leppe, Eugenio Dittborn, Catalina Parra, Carlos Altamirano, the group Cada (made up of Diamela Eltít, Raúl Zurita, Lotty Rosenfeld, Juan Castillo, and Fernando Balcells), and Juan Dávila, among others. The group formulated new methods of artistic production, experimenting, in words of Richard: “[with] the displacement of techniques, the suppression of genres, and the translation of artistic expression to the living body (performance) and the city (interventions).” By taking to the extreme “questions about the conditions and limits of artistic practice,” they developed a framework for confronting a repressive regime. Proceso de montaje de uno de los lotes. Imagen de la exposición Jovem Arte Contemporânea, 6a edición, 1972, MAC USP. Fotografía por Gerson Zanini. Imagen cortesía de MAC USP. Siempre durante mis estudios sobre arte, la curaduría fue una incógnita, un punto guía en mis investigaciones. Cada descubrimiento, se trate de curadurías realizadas aquí o fuera de Brasil, trae una nueva manera de pensar sobre el mundo, el objeto artístico y la política del espacio. Desde entonces la curaduría ha sido mi lugar de juicio, ya sea en cuestiones políticas u objetuales. Y justamente por ello, mis indagaciones se vuelcan cada vez más hacia la construcción de la noción de curaduría y curador, principalmente en la esfera de América Latina. Una reflexión necesaria para una historización de las prácticas curatoriales latinoamericanas que permita delimitar sus diferencias, haga resonar sus complejidades y amplíe nuevos horizontes. Para este estudio sobre prácticas curatoriales, y paralelamente el del curador latinoamericano, es extremadamente necesario un posicionamiento al margen. Dejar la historia contada en libros de las “culturas oficiales”, para que emerjan sus lagunas: la heterogénea gran Latinoamérica. La cuestión es fomentar la discusión y traer el conflicto porque muchas otras historias todavía no han sido contadas en dichos libros “oficiales”. ¿Qué es lo que estudiamos? Principalmente, un arte blanco de los países europeos y de América del Norte. De este modo, propongo un intento reflexivo sobre la relevancia y la construcción de la curaduría en América Latina, teniendo como idea de posicionamiento a Walter Zanini y a Frederico Morais, como hitos en el experimento de la curaduría en Brasil, por su influencia hasta hoy. Permuto. Inscrição no. 39. 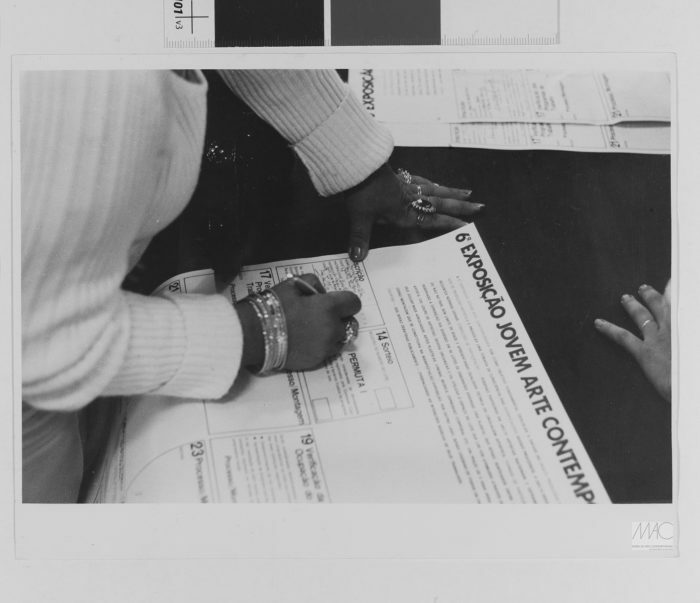 Imagen de la exposición Jovem Arte Contemporânea, 6a edición, 1972, MAC USP. Fotografía por Gerson Zanini. Imagen cortesía de MAC USP. Comienzo con la conceptualización de curaduría y curador, que como investigadora considero importante para el desarrollo de raciocinio. Sin embargo, no debe ser tomada como idea única o la más relevante, sino una más entre tantas otras. Cildo Meireles, Tiradentes – Totem Monumento ao Preso Político, 1970. Acción que consistió en la quema de diez gallinas vivas amarradas a un poste de ocho pies de alto en el aniversario del héroe nacional de la independencia de Brasil, conocido popularmente como el Tiradentes. Imagen cortesía de Galería Luisa Strina. Una curaduría es una actitud extremadamente singular que establece nuevos modos de hacer que tienen eco hasta la actualidad, posibilitando la construcción de otra historia. A partir de la idea de Morais, sobre la vanguardia como retaguardia, muchos eventos se han convertido en un hito de lo que en el futuro se conocería como campo curatorial, mismo que dio frutos no sólo en momentos turbulentos de la historia de la humanidad. Sin embargo, la época de entre guerras o los tiempos de dictaduras, como el eje de Latinoamérica en los años 60, 70 y 80, obligaron a actuar en estado de alerta debido al autoritarismo y la represión, siempre desde la precariedad. A pesar de ello, es justamente en el momento de la dictadura militar, que el campo del arte en América Latina se convierte en un campo abierto  experimental. La organización de exposiciones  era un campo de acción crítica de más alto nivel, donde, a través de la vía socio-política, lo conceptual y efímero, características específicas del arte en ese tiempo, se alteran. Tal es el caso de la exposición, Do corpo a Terra (Del Cuerpo la Tierra), organizada por Frederico Morais en 1970, en el Parque Municipal de Belo Horizonte, Minas Gerais, en donde la intención, ahora reconocida como curatorial, rompe más allá del espacio expositivo cerrado en sí, y gana, como se menciona en su título, la tierra a través del performance, los happenings, la intervención del espacio público o la participación activa del espectador. Morais no sólo reconoce cuestiones políticas, pues las obras, además de hacer alusión directa a la dictadura militar —como la obra Tiradentes – Totem Monumento ao Preso Político (1970) en la cual Cildo Meireles prende fuego a gallos vivos—, también articulan la característica procesual alrededor del tiempo y la fragilidad del efímero artístico, como sucede con la obra Trouxas Ensanguentadas (1970), de Artur Barrio, que aparentaba ser cuerpos ensangrentados envueltos en tela que aparecieron flotando en el Ribeirão Arruda. Vista de la acción de intercambio. 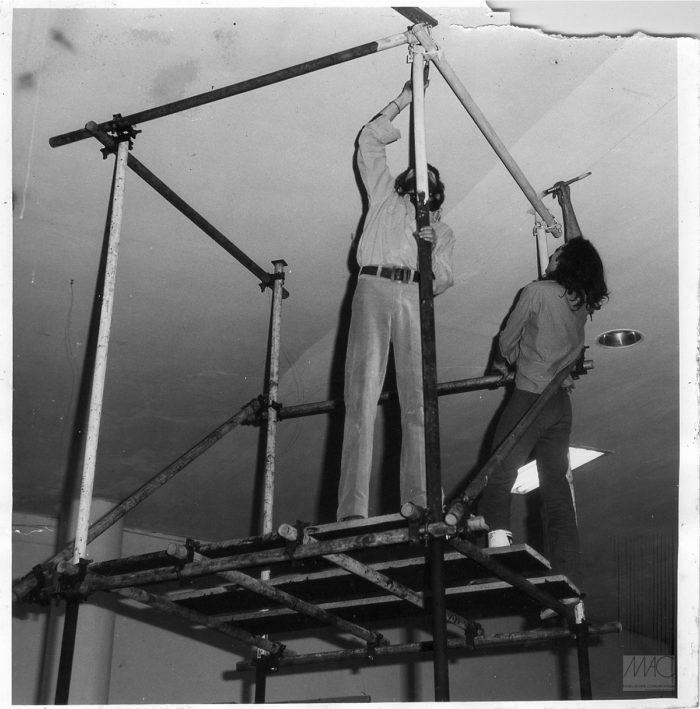 Imagen de la exposición Jovem Arte Contemporânea, 6a edición, 1972, MAC USP. Fotografía por Gerson Zanini. Imagen cortesía de MAC USP. Estas mismas líneas curatoriales que apelaban a la protesta política a través del cuerpo, se encuentran también en el programa Domingo da Criação (Domingo de Creación) que se realizó a lo largo de seis domingos entre enero y agosto de 1971 en el MAM-RJ, también organizado por Frederico Morais. Dicho programa —el cual reunió a artistas como Carlos Vergara, Antonio Manuel, Cildo Meireles, Amir Haddad, Regina Casé, entre otros— era una extensión de los cursos que impartía Morais en el MAM alrededor de prácticas educativas y museográficas. Los cursos entendían, por un lado, la posibilidad de la enseñanza artística a partir de la idea de que el taller puede ser cualquier tipo de espacio donde se encuentran profesores y alumnos y donde la realización de los trabajos respondería a los materiales disponibles en el momento. Alejándose del entendimiento tradicional de técnicas artísticas, esta reflexión pedagógica también permitía entender al museo más allá de la rigidez institucional de su espacio delimitado y su acervo para abordar sus actividades como un laboratorio de experiencias que permitan su integración a lo cotidiano a través de su extensión por toda la ciudad. Esto explica la razón por la cual los Domingos da Criação se llevaron a cabo durante el verano, época en la que los brasileños buscaban actividades en espacios abiertos. Morais definió los Domingos da Criação como “manifestaciones de libre creatividad con nuevos materiales”. Las acciones que se llevaron a cabo hacían uso de materiales —proveídos por industrias con sede en Río de Janeiro—, como hilo, papel o tierra que los artistas invitados adecuaban a los objetivos dibujados por el Manifesto Do Corpo à Terra (1970) escrito por Morais. El manifiesto explica que el arte, como un proyecto de nación a través de los museos, debía ser un ejercicio de libertad, vital para la vida social del ser humano. Hace hincapié en la importancia de organizar el arte para la comprensión de la libertad lúdica y creadora innata en el ser humano —he ahí la importancia de apartarse de la rigidez que representaba la institución museo. En su visión, el arte que se extendía más allá del objeto —hacia situaciones, eventos o rituales, individuales o colectivas— era parte de la vida misma. El arte no tenía límites y permanecía más allá de las circunstancias. Morais argumentaba que la fetichización del objeto común y corriente por parte del arte Pop era una nostalgia por encontrar vida en una existencia mercantilizada. A su vez, la “desmaterialización” del arte se extendía hasta la experiencia humana, por lo que el arte se podía encontrar en el retorno al cuerpo y a la tierra, elementos entre los que se encuentra el objeto y que permiten una relación participativa con el mismo a través de los sentidos y los elementos naturales. Las curadurías de Morais eran una actividad crítica que unían el arte a todos sin distinción de quién era o no artista. En el caso de Domingos da Criação, esto se da justamente por ocurrir en el patio del MAM-RJ, un lugar público de paso, donde la curaduría se convertía en algo común. Morais se involucró con importantes ideas contemporáneas como el Arte Povera, el happening y el body art, y lo más interesante de todo, sin dilucidarlas de modo conceptual, sino de modo natural. Paralelamente a las actividades organizadas por Morais, el profesor Walter Zanini también estaba transfigurando el espacio del museo, dejando de ser éste un agente cultural  para convertirse en un lugar dinámico, orientado a una programación diversificada con música, danza, ciclos de cine, charlas y cursos de historia del arte. Walter Zanini (1923 – 2013) fue profesor, periodista, investigador y curador, y estuvo al frente del MAC-USP hasta 1978. El profesor se destacó de forma activa en la academia, en el Departamento de Historia de la Facultad de Filosofía, Ciencia y Letras, impartió clases de Historia del Arte. Así mismo, fue uno de los fundadores de la ECA-USP (Escuela de Comunicación y Artes de la Universidad de São Paulo) y junto con Donato Ferrari, Regina Silveira y Julio Plaza idearon el programa de Artes Visuales de la Fundación Armando Álvares Penteado (FAAP). Su investigación produjo muchos artículos, periódicos y libros, entre ellos destaca “el mayor esfuerzo historiográfico jamás hecho en este sector” , Historia General del Arte en Brasil, volúmenes I y II, editado por el Instituto Moreira Salles en 1983, producción agotada hace años que involucró a un equipo de 16 expertos, entre ellos el antropólogo Darcy Ribeiro, el arquitecto y artista Carlos Lemos, el fotógrafo Boris Kossoy y la investigadora en arte y educación, Ana Mae Barbosa. Planteadas estas cuestiones, el profesor Walter Zanini junto con su equipo formado por Gabriela Wilder, Raphael Buongermino, Donato Ferrari y Laonte Klawa, teniendo en cuenta que la muestra sería abierta a todos los que quisieran participar, discutían sobre los parámetros de selección. Donato Ferrari propuso que el ingreso a la muestra fuera a través de un sorteo —que sería el primer día de la exposición—, al cual los interesados se inscribirían para concursar por lotes, mismos que fueron desarrollados por un grupo de estudiantes de Comunicación Visual de la Fundación Armando Álvares Penteado, bajo orientación del profesor Laonte Klawa quien seccionó el área expositiva temporal del MAC-USP de 1.000m² en 84 lotes de diferentes formas, convirtiendo el museo del 14 a 28 de octubre de 1972 en un gran taller. Como el énfasis era la procesualidad, la exposición niega el objeto único , pero activa la discusión sobre lo efímero y su impermanencia  logrando de esta forma una curaduría articulada, no sólo a partir del proceso, sino también a partir de la arquitectura —la relación espacio/cuerpo—, que rompe con el espacio cerrado del museo en términos arquitectónicos y burocráticos. ¿Por qué lo menciono? El MAC-USP, en aquel momento, ocupaba el 3er piso de la Fundación Bienal São Paulo, que se encuentra en el edificio de Oscar Niemeyer. Una arquitectura moderna de grandes salones internos con alturas dobles y triples, rodeadas de un armazón de largos ventanales. Un edificio imponente, más excluyente que incluyente. Proceso de montaje de la exposición. 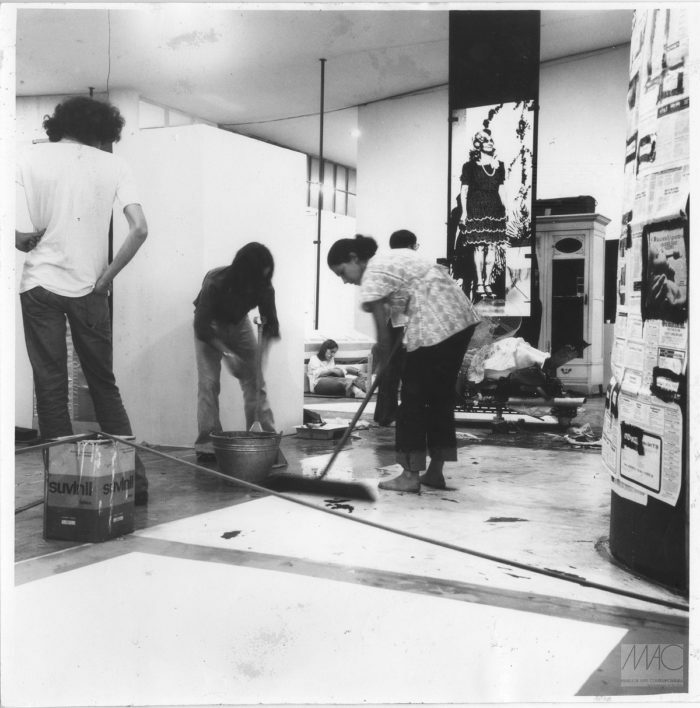 Imagen de la exposición Jovem Arte Contemporânea, 6a edición, 1972, MAC USP. Fotografía por Gerson Zanini. Imagen cortesía de MAC USP. Al igual que Morais, el profesor Zanini llevó esta actitud y radicalidad a todos los lugares donde actuó. 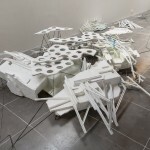 Bajo su dirección a cargo del Museo de Arte Contemporáneo de la Universidad de São Paulo, MAC-USP, se organizaron muestras nacionales e internacionales entre las que destacan: las exposiciones de obras de Vicente Rego Monteiro, Anita Malfatti y Flávio de Carvalho que formaban parte del acervo; el proyecto internacional del programa del Museo de Arte de Nueva York; la primera exposición en Brasil del fotógrafo Cartier-Bresson en 1970, entre otras. El espacio también efectuó un trabajo de recuperación con la muestra en 1965 del pintor y músico Jeff Golyscheff (1898 – 1970), quien perteneció al grupo Dadá, en Berlín. Golyscheff vivía anónimamente en São Paulo, hasta el día en que entró al museo y contó toda su historia a Zanini, después de que se había creído muerto en Europa. Así mismo, cuando estuvo a cargo de la 16ª y 17ª edición de la Bienal de Arte de São Paulo, su curaduría marcó el fin de la división museográfica exclusivamente por países, como sucedió en la 16a edición donde articuló a artistas como Anna Bella Geiger, Cildo Meireles y Richard Long, o en el caso de la edición 17a donde conjuga técnicas tradicionales, como el arte plumaria con el Grupo Fluxus. Esa misma edición, por su integración de video arte y nuevos lenguajes dejó en claro que el profesor fue uno de los mayores difusores y legitimadores de dichos medios, estableciendo, por ejemplo, el primer sector de video arte en el país en el MAC-USP. Tanto Walter Zanini como Frederico Morais abordaron el espíritu de radicalidad, conectado no sólo al concepto de acontecimiento trabajado por Milton Santos, sino también al concepto de antropofágia. Con esta filosofía, a través del Manifiesto Antropofágico escrito en 1928, Oswald de Andrade argumenta no sólo a favor de la búsqueda de nuestros orígenes, sino también apela a una mirada hacia el otro, la alteridad. Fundando así la ruptura de frontera, el híbrido y los principios de la apropiación, discutidos por David Evans en Appropriation (2009). De Andrade propone atravesamientos y cruces entre culturas, y una inmersión en nuestros orígenes, cuestión que luego culminaría en la Tropicália. De este modo en esas interceptaciones se da el surgimiento del otro a partir de lo común, que permean el núcleo del pensamiento democratizador de estos grandes maestros. Inscripción para el sorteo de lotes. Imagen de la exposición Jovem Arte Contemporânea, 6a edición, 1972, MAC USP. Fotografía por Gerson Zanini. Imagen cortesía de MAC USP. 1. Bakhtin, Mikhail. A cultura popular na Idade Média e no Renascimento. (São Paulo: Universidad de Brasilia, 1987), p. 238, 239. 2. Néstor García Canclini. Culturas Híbridas. Estrategias para entrar y salir de la modernidad, p. 37. 3. Hans Ulrich Obrist. Una breve historia de la curaduría. Prefácio Nessia Leonzini. São Paulo: Bei, 2010. 4. Milton Santos. A Natureza do Espaço: Técnica e Tempo, Razão e Emoção (São Paulo: EDUSP, 2006), p. 94. 5. Hans Ulrich Obrist. Ibid., p. 16. 6. Milton Santos. Natureza do Espaço, Técnica e Tempo, Razão e Emoção, 1996. p. 94, 96. 9. En ese tiempo en Brasil, el término curaduría no existía. En su lugar era aplicado el término organización de exposiciones aplicado a la organización de muestras que críticos de arte o académicos realizaban en museos, espacios culturales y galerías. 10. M. A Ribeiro. Entrevista con Frederico Morais, A Arte Nao Pertenece a Ninguém. UFMG, Belo Horizonte, V. 20, n.1, p.336-351, enero/junio, 2013. 11. Dária Gorete Jaremtchuk, Jovem Arte Contemporânea en MAC-USP (Tesis de maestria en la Universidad de São Paulo, 1999), p. 4. 12. Angélica Morais, “Morre Mestre Zanini,” Revista Select, enero 29, 2013. 16. Walter Zanini. Novas Potencialidade. Catálogo 6ª Exposição Jovem Arte Contemporânea, 1972. 18. Paralelamente, fuera de Brasil me gustaría destacar la producción artística gestada a partir de 1973 por el grupo Escena Avanzada, durante el periodo de la dictadura militar chilena. Una producción, que como menciona la crítica y curadora Nelly Richard, pertenece al “campo no oficial” del arte de Chile, lejos de las grandes categorizaciones historiográficas del arte. Escena Avanzada estaba constituida por los artístas Carlos Leppe, Eugenio Dittborn, Catalina Parra, Carlos Altamirano, el Grupo Cada (conformado por Diamela Eltít, Raúl Zurita, Lotty Rosenfeld, Juan Castillo y Fernando Balcells), Juan Dávila, entre otros. El grupo reformulaba nuevas articulaciones de producción artística, experimentando, en palabras de Richard: “[el] desplazamiento de las técnicas, la supresión de los géneros y la traslación de los soportes del arte al cuerpo vivo (performance) y a la ciudad (intervenciones).” Llevan al “extremo preguntas en torno a las condiciones y límites de la práctica artística”, es decir, un marco en el régimen represivo.